Motorcycle & ATV Audio. Car Video & Navigation. DJ & Pro Audio. Home Audio & Video. Cell Phones & MP3 Accessories. 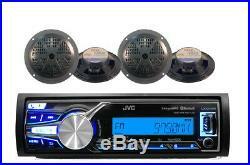 A total of 4 speakers are included in this package. Want to get the most out of your receiver? 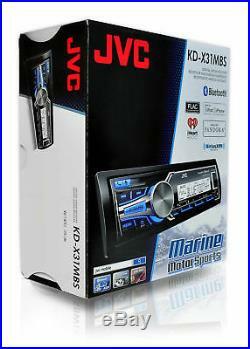 The JVC KD-X35MBS features an array of options. You can connect 2 phones through built-in Bluetooth technology, and get music play back for android. It comes with a front USB input with 1.5A charging capabilities. 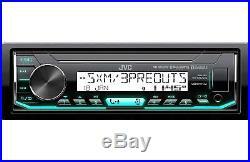 It also has a front AUX input. Menu options also come in either English or Spanish. 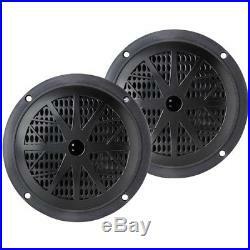 Pair PLMR51B Pyle 100 Watts 5.25” 2 Way Marine Speakers (Black) (x2). Pyle’s Hydra series speakers are waterproof and designed for use in your boat, on the dock, by the pool, or simply mounted outside. They’re designed with rust-proof mesh covers for quality protection. The PLMR51B is a black 5.25′ dual-cone, full-range speaker suitable for marine use. They’re rated at 100 watts for big power. The polypropylene cone accurately reproduces sound, and the molded ABS plastic basket keeps your sound distortion-free. 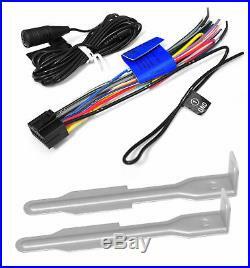 Package includes mounting hardware and wires. 5.25” Dual Cone Full-Range Speakers. 100 Watts Rated Power. For Marine or Car Use. Polypropylene Cone w/Cloth Surround. Molded ABS Plastic Basket. Frequency Response: 100Hz – 18k Hz. Slim Mounting Depth: 1.5′. Complete with Wires Mounting Hardware. Cut-out Size: F122 mm. For your convenience, have us address all your questions and concerns prior to purchasing. At Road Depot we do everything for assuring you a smooth and fun shopping experience. You’re therefore eager to actually have it, see it, and hold it in your very hands. For heaven’s sake, you want to use it, like immediately, right? Need your order sooner? APO/FPO addresses and other U. For the most part, orders will be delivered to APO/FPO addresses and U. How to return an item? If the need for returning an item arises, either because of a change in mind or in the unlikely event of the product arriving with a defect, you can do so by following a few short and simple steps. Get your Return Authorization. Please call if the return involves a defective product. Place the item, it’s accessories and manuals in the original packaging. So please be sure to use them when returning an item. Remove or mark out the original labels and secure one completed label to each package. For the nearest location. After receiving your package, we will immediately start the process of exchanging or refunding your order. International Customers Return We’re doing our utmost to provide you with a smooth and easy return-process. Road Depot has been connecting consumers and enthusiasts of personal, mobile, and marine audio/video, equipment, tools and toys to the right product since its inception in 2003. We pride ourselves with our unique approach of customized E-packages suiting your specific audio and video needs for turning your home entertainment, road ride, or boat adventure into a joyous experience. At Road Depot, we’re sparing you the hustle and hassle of endlessly searching and sifting for the product you’re looking for. You’ll be thrilled by the user-friendly and an at-your-fingertips selection of customized packages and kits, fitting your specific home, car, truck, boat, and ATV entertainment needs. What should you be expecting when setting out to browse our website? Basically, anything and everything relating to mobile audio and video products, tools, equipment, and systems, as well as a dazzling selection of consumer electronics from world renowned brands at the most compatible prices. Such are the facts and this is what you could and should expect. Whether it’s rocking your party boat or music for a yoga class on the grass; tunes for your kids’ birthday bash or a Tuesday night Zumba class, we got the perfect product to fulfill your desire. Let us know what you have in mind, and we’ll speedily put it together and over get it to your doorstep at the most reasonable prices. Our agents work around the globe as well as attend all major trade shows to bring you the best possible listening and viewing options this ever-changing and constantly evolving industry has to offer. You will find the results of this tireless team-work in Road Depot ever changing and constantly updated stock. Congratulations on joining our satisfied customer base and talk to us anytime about anything in the business! We welcome your inquiry! Please bookmark us to your favorites list and visit often! All brand names, logos, and trademarks referenced on this site remain the property of their respective manufacturers/owners. We’re not responsible for typographical or illustrative errors. All sales are subject to approval by Road Depot. 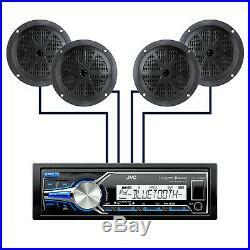 Enrock Marine 6.5 2 Way 200Watt Black Speakers Featuring Multi Color LEDs. Enrock Marine Wire Antenna Balck. Details about Enrock Audio 16-Gauge 50 Foot Car Audio Speaker Wire. Enrock Marine Single Din Radio Dash Cover Boat/OffRo? Ad, Spring Loaded, Tinted. The item “JVC Marine Boat Bluetooth USB AM/FM Radio AUX Input Receiver 4 x 5.25 Speakers” is in sale since Thursday, February 1, 2018. 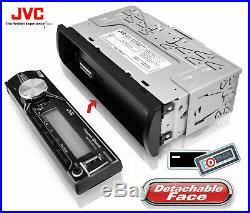 This item is in the category “Consumer Electronics\Vehicle Electronics & GPS\Car Audio\Car Audio In-Dash Units”. The seller is “roaddepot” and is located in Monsey, New York. This item can be shipped to United States, Canada, United Kingdom, Denmark, Romania, Slovakia, Bulgaria, Finland, Hungary, Lithuania, Malta, Estonia, Australia, Greece, Portugal, Cyprus, Slovenia, Japan, China, Sweden, South Korea, Indonesia, Taiwan, Belgium, France, Hong Kong, Ireland, Netherlands, Poland, Spain, Italy, Germany, Austria, Bahamas, Israel, New Zealand, Philippines, Singapore, Switzerland, Norway, Saudi arabia, United arab emirates, Qatar, Kuwait, Bahrain, Croatia, Malaysia, Brazil, Chile, Colombia, Costa rica, Panama, Trinidad and tobago, El salvador, Honduras, Jamaica, Antigua and barbuda, Aruba, Belize, Dominica, Grenada, Saint kitts and nevis, Saint lucia, Turks and caicos islands, Barbados, Bangladesh, Brunei darussalam, Bolivia, Ecuador, Egypt, French guiana, Gibraltar, Guadeloupe, Iceland, Jordan, Cambodia, Cayman islands, Luxembourg, Monaco, Martinique, Maldives, Nicaragua, Oman, Pakistan, Paraguay, Reunion.